1 A None No Power Seat 1 A is a BEST Premium Economy Class seat that features additional legroom, additional recline, and a leg rest. There is no floor storage available for use during take-off and landing. The close proximity to the galleys and lavatory area might be bothersome. 1 C None No Power Seat 1 C is a BEST Premium Economy Class seat that features additional legroom, additional recline, and a leg rest. There is no floor storage available for use during take-off and landing. The close proximity to the galleys and lavatory area might be bothersome. 1 D None No Power Seat 1 D is a BEST Premium Economy Class seat that features additional legroom, additional recline, and a leg rest. There is no floor storage available for use during take-off and landing. The close proximity to the galleys and lavatory area might be bothersome. 1 F None No Power Seat 1 F is a BEST Premium Economy Class seat that features additional legroom, additional recline, and a leg rest. There is no floor storage available for use during take-off and landing. The close proximity to the galleys and lavatory area might be bothersome. 1 G None No Power Seat 1 G is a BEST Premium Economy Class seat that features additional legroom, additional recline, and a leg rest. There is no floor storage available for use during take-off and landing. The close proximity to the galleys and lavatory area might be bothersome. 1 H None No Power Seat 1 H is a BEST Premium Economy Class seat that features additional legroom, additional recline, and a leg rest. There is no floor storage available for use during take-off and landing. The close proximity to the galleys and lavatory area might be bothersome. 1 K None No Power Seat 1 K is a BEST Premium Economy Class seat that features additional legroom, additional recline, and a leg rest. There is no floor storage available for use during take-off and landing. The close proximity to the galleys and lavatory area might be bothersome. 10 A None No Power Seat 10 A is a standard Economy Class seat located at a bulkhead and in an area with additional legroom. This seat may be selected for an additional fee. There is no floor storage for use during take-off and landing. The tray table and the IFE monitor are placed in the armrest making the armrest immovable and slightly reducing seat width. 10 C None No Power Seat 10 C is a standard Economy Class seat located at a bulkhead and in an area with additional legroom. This seat may be selected for an additional fee. There is no floor storage for use during take-off and landing. The tray table and the IFE monitor are placed in the armrest making the armrest immovable and slightly reducing seat width. 10 D None No Power Seat 10 D is a standard Economy Class seat located at a bulkhead and in an area with additional legroom. This seat may be selected for an additional fee. There is no floor storage for use during take-off and landing. The tray table and the IFE monitor are placed in the armrest making the armrest immovable and slightly reducing seat width. 10 E None No Power Seat 10 E is a standard Economy Class seat located at a bulkhead and in an area with additional legroom. This seat may be selected for an additional fee. There is no floor storage for use during take-off and landing. The tray table and the IFE monitor are placed in the armrest making the armrest immovable and slightly reducing seat width. 10 F None No Power Seat 10 F is a standard Economy Class seat located at a bulkhead and in an area with additional legroom. This seat may be selected for an additional fee. There is no floor storage for use during take-off and landing. The tray table and the IFE monitor are placed in the armrest making the armrest immovable and slightly reducing seat width. 10 G None No Power Seat 10 G is a standard Economy Class seat located at a bulkhead and in an area with additional legroom. This seat may be selected for an additional fee. There is no floor storage for use during take-off and landing. The tray table and the IFE monitor are placed in the armrest making the armrest immovable and slightly reducing seat width. The close proximity to the lavatory might be bothersome. 11 A None No Power Seat 11 A is a standard Economy Class seat in an area with additional legroom. This seat may be selected for an additional fee. 11 C None No Power Seat 11 C is a standard Economy Class seat in an area with additional legroom. This seat may be selected for an additional fee. 11 D None No Power Seat 11 D is a standard Economy Class seat in an area with additional legroom. This seat may be selected for an additional fee. 11 E None No Power Seat 11 E is a standard Economy Class seat in an area with additional legroom. This seat may be selected for an additional fee. 11 F None No Power Seat 11 F is a standard Economy Class seat in an area with additional legroom. This seat may be selected for an additional fee. 11 G None No Power Seat 11 G is a standard Economy Class seat in an area with additional legroom. This seat may be selected for an additional fee. The close proximity to the lavatory might be bothersome. 11 H None No Power Seat 11 H is a standard Economy Class seat located at a bulkhead and in an area with additional legroom. This seat may be selected for an additional fee. There is no floor storage for use during take-off and landing. The tray table and the IFE monitor are placed in the armrest making the armrest immovable and slightly reducing seat width. The close proximity to the lavatory might be bothersome. 11 K None No Power Seat 11 K is a standard Economy Class seat located at a bulkhead and in an area with additional legroom. This seat may be selected for an additional fee. There is no floor storage for use during take-off and landing. The tray table and the IFE monitor are placed in the armrest making the armrest immovable and slightly reducing seat width. The close proximity to the lavatory might be bothersome. 12 A None No Power Seat 12 A is a standard Economy Class seat in an area with additional legroom. This seat may be selected for an additional fee. 12 C None No Power Seat 12 C is a standard Economy Class seat in an area with additional legroom. This seat may be selected for an additional fee. 12 D None No Power Seat 12 D is a standard Economy Class seat in an area with additional legroom. This seat may be selected for an additional fee. 12 E None No Power Seat 12 E is a standard Economy Class seat in an area with additional legroom. This seat may be selected for an additional fee. 12 F None No Power Seat 12 F is a standard Economy Class seat in an area with additional legroom. This seat may be selected for an additional fee. 12 G None No Power Seat 12 G is a standard Economy Class seat in an area with additional legroom. This seat may be selected for an additional fee. 12 H None No Power Seat 12 H is a standard Economy Class seat in an area with additional legroom. This seat may be selected for an additional fee. 12 K None No Power Seat 12 K is a standard Economy Class seat in an area with additional legroom. This seat may be selected for an additional fee. 14 A None No Power Seat 14 A is a standard Economy Class seat in an area with additional legroom. This seat may be selected for an additional fee. 14 C None No Power Seat 14 C is a standard Economy Class seat in an area with additional legroom. This seat may be selected for an additional fee. 14 D None No Power Seat 14 D is a standard Economy Class seat in an area with additional legroom. This seat may be selected for an additional fee. 14 E None No Power Seat 14 E is a standard Economy Class seat in an area with additional legroom. This seat may be selected for an additional fee. 14 F None No Power Seat 14 F is a standard Economy Class seat in an area with additional legroom. This seat may be selected for an additional fee. 14 G None No Power Seat 14 G is a standard Economy Class seat in an area with additional legroom. This seat may be selected for an additional fee. 14 H None No Power Seat 14 H is a standard Economy Class seat in an area with additional legroom. This seat may be selected for an additional fee. 14 K None No Power Seat 14 K is a standard Economy Class seat in an area with additional legroom. This seat may be selected for an additional fee. 15 A None No Power Seat 15 A is a standard Economy Class seat in an area with additional legroom. This seat may be selected for an additional fee. 15 C None No Power Seat 15 C is a standard Economy Class seat in an area with additional legroom. This seat may be selected for an additional fee. 15 D None No Power Seat 15 D is a standard Economy Class seat in an area with additional legroom. This seat may be selected for an additional fee. 15 E None No Power Seat 15 E is a standard Economy Class seat in an area with additional legroom. This seat may be selected for an additional fee. 15 F None No Power Seat 15 F is a standard Economy Class seat in an area with additional legroom. This seat may be selected for an additional fee. 15 G None No Power Seat 15 G is a standard Economy Class seat in an area with additional legroom. This seat may be selected for an additional fee. 15 H None No Power Seat 15 H is a standard Economy Class seat in an area with additional legroom. This seat may be selected for an additional fee. 15 K None No Power Seat 15 K is a standard Economy Class seat in an area with additional legroom. This seat may be selected for an additional fee. 16 A None No Power Seat 16 A is a standard Economy Class seat in an area with additional legroom. This seat may be selected for an additional fee. 16 C None No Power Seat 16 C is a standard Economy Class seat in an area with additional legroom. This seat may be selected for an additional fee. 16 D None No Power Seat 16 D is a standard Economy Class seat in an area with additional legroom. This seat may be selected for an additional fee. 16 E None No Power Seat 16 E is a standard Economy Class seat in an area with additional legroom. This seat may be selected for an additional fee. 16 F None No Power Seat 16 F is a standard Economy Class seat in an area with additional legroom. This seat may be selected for an additional fee. 16 G None No Power Seat 16 G is a standard Economy Class seat in an area with additional legroom. This seat may be selected for an additional fee. 16 H None No Power Seat 16 H is a standard Economy Class seat in an area with additional legroom. This seat may be selected for an additional fee. 16 K None No Power Seat 16 K is a standard Economy Class seat in an area with additional legroom. This seat may be selected for an additional fee. 2 A None No Power Seat 2 A is a BEST Premium Economy Class seat that features additional legroom, additional recline, and a leg rest. 2 C None No Power Seat 2 C is a BEST Premium Economy Class seat that features additional legroom, additional recline, and a leg rest. 2 D None No Power Seat 2 D is a BEST Premium Economy Class seat that features additional legroom, additional recline, and a leg rest. 2 F None No Power Seat 2 F is a BEST Premium Economy Class seat that features additional legroom, additional recline, and a leg rest. 2 G None No Power Seat 2 G is a BEST Premium Economy Class seat that features additional legroom, additional recline, and a leg rest. 2 H None No Power Seat 2 H is a BEST Premium Economy Class seat that features additional legroom, additional recline, and a leg rest. 2 K None No Power Seat 2 K is a BEST Premium Economy Class seat that features additional legroom, additional recline, and a leg rest. 29 A None No Power Seat 29 A is a standard Economy Class seat located in the last row of the section. Seat back recline might be limited. The close proximity to the lavatory area might be bothersome. 29 C None No Power Seat 29 C is a standard Economy Class seat located in the last row of the section. Seat back recline might be limited. The close proximity to the lavatory area might be bothersome. 29 D None No Power Seat 29 D is a standard Economy Class seat located in the last row of the section. Seat back recline might be limited. The close proximity to the lavatory area might be bothersome. 29 E None No Power Seat 29 E is a standard Economy Class seat located in the last row of the section. Seat back recline might be limited. The close proximity to the lavatory area might be bothersome. 29 F None No Power Seat 29 F is a standard Economy Class seat located in the last row of the section. Seat back recline might be limited. The close proximity to the lavatory area might be bothersome. 29 G None No Power Seat 29 G is a standard Economy Class seat located in the last row of the section. Seat back recline might be limited. The close proximity to the lavatory area might be bothersome. 29 H None No Power Seat 29 H is a standard Economy Class seat located in the last row of the section. Seat back recline might be limited. The close proximity to the lavatory area might be bothersome. 29 K None No Power Seat 29 K is a standard Economy Class seat located in the last row of the section. Seat back recline might be limited. The close proximity to the lavatory area might be bothersome. 3 A None No Power Seat 3 A is a BEST Premium Economy Class seat that features additional legroom, additional recline, and a leg rest. 3 C None No Power Seat 3 C is a BEST Premium Economy Class seat that features additional legroom, additional recline, and a leg rest. 3 D None No Power Seat 3 D is a BEST Premium Economy Class seat that features additional legroom, additional recline, and a leg rest. 3 F None No Power Seat 3 F is a BEST Premium Economy Class seat that features additional legroom, additional recline, and a leg rest. 3 G None No Power Seat 3 G is a BEST Premium Economy Class seat that features additional legroom, additional recline, and a leg rest. 3 H None No Power Seat 3 H is a BEST Premium Economy Class seat that features additional legroom, additional recline, and a leg rest. 3 K None No Power Seat 3 K is a BEST Premium Economy Class seat that features additional legroom, additional recline, and a leg rest. 30 A None No Power Seat 30 A is a standard Economy Class seat located in the Exit Row that features additional legroom. There is no floor storage available for use during take-off and landing. The tray table and IFE monitor are placed in the armrest making the armrest immovable and slightly reducing seat width. The close proximity to the lavatory area might be bothersome. 30 C None No Power Seat 30 C is a standard Economy Class seat located in the Exit Row that features additional legroom. There is no floor storage available for use during take-off and landing. The tray table and IFE monitor are placed in the armrest making the armrest immovable and slightly reducing seat width. The close proximity to the lavatory area might be bothersome. 30 D None No Power Seat 30 D is a standard Economy Class seat located in the Exit Row that features additional legroom. There is no floor storage available for use during take-off and landing. The tray table and IFE monitor are placed in the armrest making the armrest immovable and slightly reducing seat width. The close proximity to the lavatory area might be bothersome. 30 E None No Power Seat 30 E is a standard Economy Class seat located in the Exit Row that features additional legroom. There is no floor storage available for use during take-off and landing. The tray table and IFE monitor are placed in the armrest making the armrest immovable and slightly reducing seat width. The close proximity to the lavatory area might be bothersome. 30 F None No Power Seat 30 F is a standard Economy Class seat located in the Exit Row that features additional legroom. There is no floor storage available for use during take-off and landing. The tray table and IFE monitor are placed in the armrest making the armrest immovable and slightly reducing seat width. The close proximity to the lavatory area might be bothersome. 30 G None No Power Seat 30 G is a standard Economy Class seat located in the Exit Row that features additional legroom. There is no floor storage available for use during take-off and landing. The tray table and IFE monitor are placed in the armrest making the armrest immovable and slightly reducing seat width. The close proximity to the lavatory area might be bothersome. 30 H None No Power Seat 30 H is a standard Economy Class seat located in the Exit Row that features additional legroom. There is no floor storage available for use during take-off and landing. The tray table and IFE monitor are placed in the armrest making the armrest immovable and slightly reducing seat width. The close proximity to the lavatory area might be bothersome. 30 K None No Power Seat 30 K is a standard Economy Class seat located in the Exit Row that features additional legroom. There is no floor storage available for use during take-off and landing. The tray table and IFE monitor are placed in the armrest making the armrest immovable and slightly reducing seat width. The close proximity to the lavatory area might be bothersome. 39 G None No Power Seat 39 G is a standard Economy Class seat. This seat might be bumped by passengers and crew passing from the back of the aircraft. 4 A None No Power Seat 4 A is a standard Economy Class seat located at a bulkhead. There is no floor storage for use during take-off and landing. The tray table and the IFE monitor are placed in the armrest making the armrest immovable and slightly reducing seat width. 4 C None No Power Seat 4 C is a standard Economy Class seat located at a bulkhead. There is no floor storage for use during take-off and landing. The tray table and the IFE monitor are placed in the armrest making the armrest immovable and slightly reducing seat width. 4 D None No Power Seat 4 D is a standard Economy Class seat located at a bulkhead. There is no floor storage for use during take-off and landing. The tray table and the IFE monitor are placed in the armrest making the armrest immovable and slightly reducing seat width. 4 E None No Power Seat 4 E is a standard Economy Class seat located at a bulkhead. There is no floor storage for use during take-off and landing. The tray table and the IFE monitor are placed in the armrest making the armrest immovable and slightly reducing seat width. 4 F None No Power Seat 4 F is a standard Economy Class seat located at a bulkhead. There is no floor storage for use during take-off and landing. The tray table and the IFE monitor are placed in the armrest making the armrest immovable and slightly reducing seat width. 4 G None No Power Seat 4 G is a standard Economy Class seat located at a bulkhead. There is no floor storage for use during take-off and landing. The tray table and the IFE monitor are placed in the armrest making the armrest immovable and slightly reducing seat width. 4 H None No Power Seat 4 H is a standard Economy Class seat located at a bulkhead. There is no floor storage for use during take-off and landing. The tray table and the IFE monitor are placed in the armrest making the armrest immovable and slightly reducing seat width. 4 K None No Power Seat 4 K is a standard Economy Class seat located at a bulkhead. There is no floor storage for use during take-off and landing. The tray table and the IFE monitor are placed in the armrest making the armrest immovable and slightly reducing seat width. 43 A None No Power Seat 43 A is a standard Economy Class seat located in the last row of the aircraft. Seat back recline might be limited. The close proximity to the galley might be bothersome. 43 C None No Power Seat 43 C is a standard Economy Class seat located in the last row of the aircraft. Seat back recline might be limited. The close proximity to the galley might be bothersome. 43 D None No Power Seat 43 D is a standard Economy Class seat. The close proximity to the galley area might be bothersome. 43 G None No Power Seat 43 G is a standard Economy Class seat. The close proximity to the galley area might be bothersome. 43 H None No Power Seat 43 H is a standard Economy Class seat located in the last row of the aircraft. Seat back recline might be limited. The close proximity to the galley might be bothersome. 43 K None No Power Seat 43 K is a standard Economy Class seat located in the last row of the aircraft. Seat back recline might be limited. The close proximity to the galley might be bothersome. 44 D None No Power Seat 44 D is a standard Economy Class seat located in the last row of the aircraft. Seat back recline might be limited. The close proximity to the galley area might be bothersome. 44 F None No Power Seat 44 F is a standard Economy Class seat located in the last row of the aircraft. Seat back recline might be limited. The close proximity to the galley area might be bothersome. 44 G None No Power Seat 44 G is a standard Economy Class seat located in the last row of the aircraft. Seat back recline might be limited. The close proximity to the galley area might be bothersome. 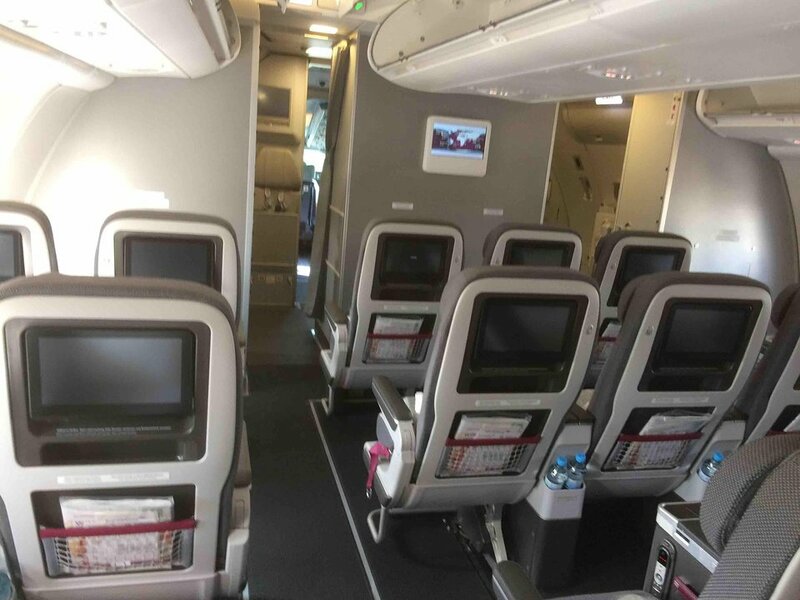 Music is available through the Wings Entertain entertainment system accessed through the seat back monitor. You may also connect with your own device(s) to stream. If you prefer to stream to your own device(s) then the free Wings Entertain app should be downloaded from the Apple and/or Google app stores before your flight. Microsoft notebook users should also download Microsoft Silverlight browser plug-in. Movies, television series, children's feature, games, and audio books are available through the Wings Entertain entertainment system accessed through the seat back monitor. You may also stream to your own device(s). If you prefer to stream to your own device(s) then the free Wings Entertain app should be downloaded from the Apple and/or Google app stores before your flight. Microsoft notebook users should also download Microsoft Silverlight browser plug-in. 110v powerports are available at every seat in the BEST section. USB powerports are available at every seat. Wi-Fi internet access is available on the Eurowings A330 aircraft. The program is named Wings Connect. Several packages of varying use and cost are available. Additional information may be accessed by clicking here. Eurowings' Airbus A330-200 aircraft are used on long-range intercontinental routes from Europe to Asia, The Caribbean, and North America. The twin-aisle wide-body aircraft offers comfortable space, enhanced entertainment offerings, and is one of the most technologically advanced aircraft in the industry. 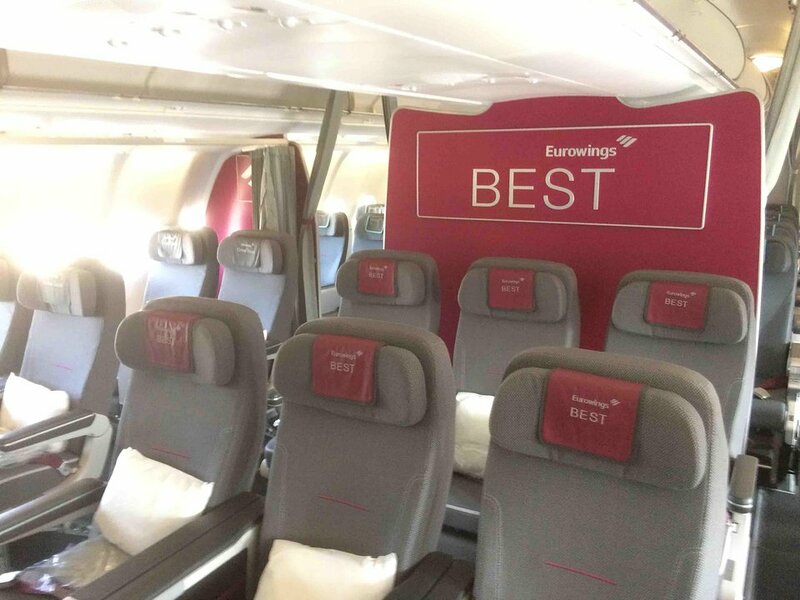 Eurowings' BEST fare class is available on this aircraft. Additional personal space is provided with wider seats and additional legroom. Quite comfortable, tremendous legroom, solid tables. OK space even when the person in 10 reclined fully. Slept solidly from the meal service (satisfying) 'til final approach, Dakar-Brussels. The flight was operated by Brussels Airlines but had the Eurowings livery, entertainment, etc. Seat is an ok economy class seat. However, I must stress that service and food in "smart fare" are the worst! Entertainment costs 9.90 Euros extra, but the content is limited and boring. There's only a few random episodes of TV series - nothing consecutive. So what's the point?! Food quality and appearance is appalling! Great seat in Best class. Loads of legroom compared to other premium economy products. You can fully recline without bothering anyone due to the wall behind. The person in 3C doesn't need to get up when you want to get out. Used it on flight CGNSEA. Service was very friendly and attentive. Seat 2A in BEST Class is very comfortable. The service and Entertainment System is very good. I recommend this Seat. Seat 30 H and K are exit row seats. Very much legroom. It might be near to infants, DEFG are seats with baby bassinet. Great seat, Eurowings is using the same seats as LH for their Premium Economy. Lots of room. Note that on long haul flights, the seats 2H/K and 3H/K are reserved as Crew Rest. All seats in first row have less leg space than other seats in "Best Class"
Eurowings flies 1 versions of Airbus A330.